I’ve moved some of my better termite photos to a new gallery at alexanderwild.com. Zootermopsis soldier termite, jaws at the ready. 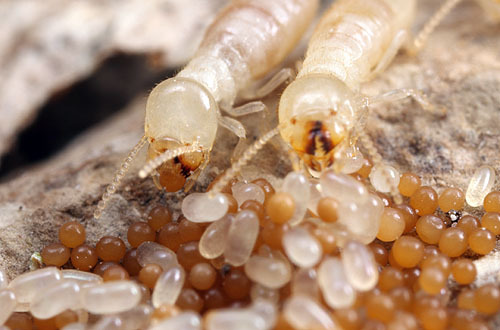 If you think of termites as pasty white squishy things, here’s one that’ll jar your preconceptions. Zootermopsis dampwood termites of western North America have large soldiers- over a centimeter long- that are muscular and well armored. 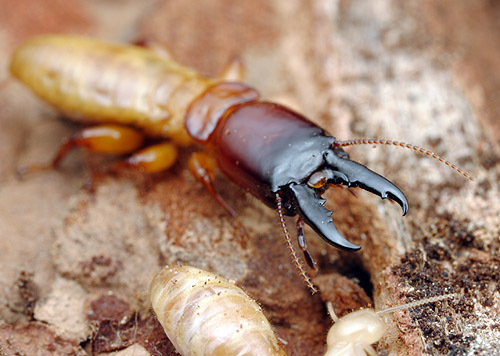 Soldiers are deployed not against predators but against other termites, as colonies within a single rotting log fight when they encounter each other. Those jaws are ideal for slicing through an enemy queen, for example, or for protecting their own. 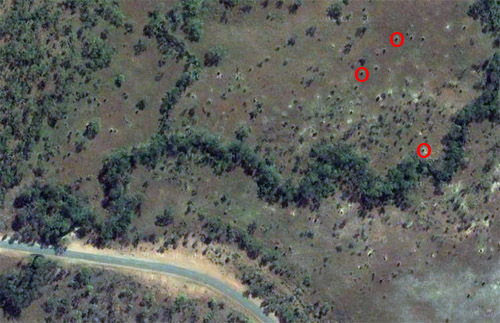 Termite mounds visible in Australia's Northern Territory- I've circled three, but dozens are in the image. 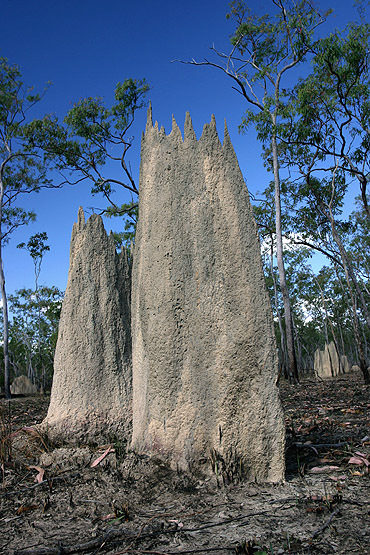 A magnetic termite mound in north Queensland, Australia. The mounds are shaped as thin blades along a north-south orientation as though following compass direction. The reasons for this odd architecture are still a matter of research, but the general view is that the shape helps termites avoid the heat of the tropical midday sun, and the extra surface area allows for more efficient respiration. 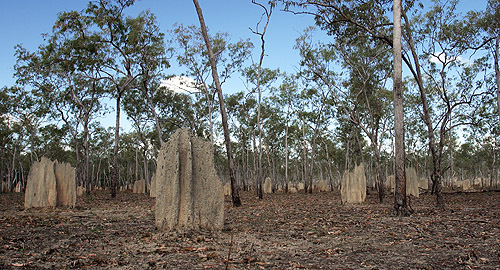 The density of termite mounds can be impressive. More insects in Google earth here and here. 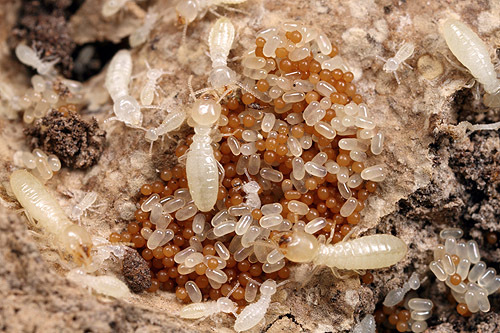 I did not expect everyone to nearly instantaneously solve yesterday’s termite ball mystery. I’m either going to have to post more difficult challenges (from now on, nothing will be in focus!) or attract a slower class of reader. Cuckoo fungus grows in a termite nest. As you surmised, those little orange balls are an egg-mimicking fungus. It is related to free-living soil fungi, but this one has adopted a novel growth form that is similar in diameter, texture, and surface chemistry to the eggs of Reticulitermes termites. These hardened sclerotia are carried about the termite nest as if they were the termite’s own offspring, earning them the title “Cuckoo fungus”. 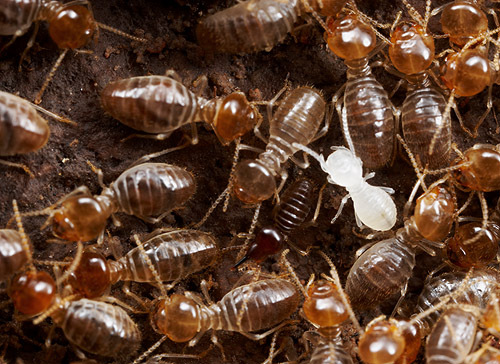 Since termites are blind there is no advantage to the fungus in visually looking like an egg, though, so we sighted creatures can tell the difference at a glance. For more about the Cuckoo fungus, check out the publications of Kenji Matsuura. Matsuura first identified the balls as a fungus ten years ago, as a graduate student, and has been working on them ever since. 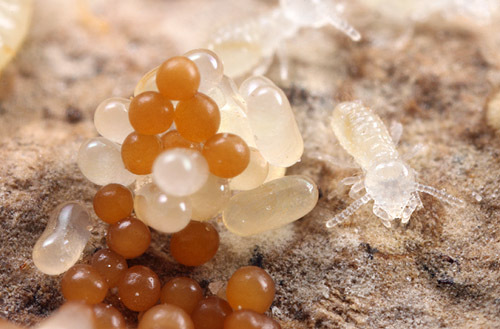 Termites can't tell the difference between their own eggs (white) and the fungal sclerotia (orange). …they’re something far more interesting. Ten points to the first person who identifies the orange balls. These were photographed inside a termite nest in southern Illinois last fall. Photo details: Canon MP-E 65mm 1-5x macro lens on a Canon EOS 20D.